336 pages | 24 B/W Illus. 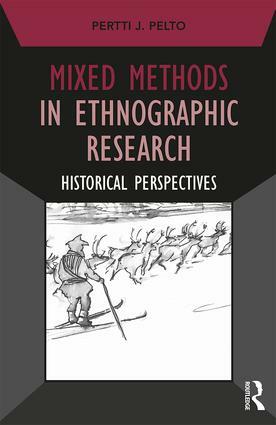 Mixed Methods in Ethnographic Research: Historical Perspectives captures the dynamic history and development of mixed methods research in a narrative of personal discovery, growth, and experience. Distinguished ethnographer and methodologist Pertti Pelto, who first called for the integration of qualitative and quantitative research methods nearly half a century ago, establishes a direct line between the earliest examples of ethnographic research and the ongoing mixed method discussions in academic institutions throughout the world. By bringing together such distinct historical perspectives with his own reflections on mixed methods research, Pelto offers a rare and endlessly enriching account that will satisfy the ever-growing need for a better quality of practical data gathering and give researchers a foundation for promoting mixed methods in the future. Prime architect of the methodology of employing mixed methods in ethnographic research, Pertti J Pelto, traces it's historical evolution globally. His personal narrative provides practical, experiential learnings for obtaining nuanced answers to complex research questions. Through decades of work with research networks and communities in India and other developing countries, Pelto succeeded in legitimizing the once suspect qualitative techniques. It is because of his untiring efforts that integrating qualitative with quantitative methods has become the norm today. Only Pertti Pelto could have written this history –a tour de force of erudition. The book makes clear that anthropology is and has always been about mixed methods, but social scientists of all stripes will find wonderful material here for teaching mixed methods. In his latest book, Pertti Pelto takes us on a captivating, personal and historical tour of the use of mixed methods in social science research. His narrative style and stories from the from the field make this both a fun read and an important reference for students and researchers who want to gain a broader understanding of past and present developments in ethnographic research methods. Mixed Methods Research captures a wide and throughout picture of ethnographical research methods. It brings interestingly together the historical development and Pelto’s personal reflections on interaction of qualitative and quantitative research methods. Pelto’s wide experience of ethnographical research makes this book is an enjoyable reading and important guide for students as well as professional scholars all over the world. This book answers to a growing need for a practical guide in data-gathering. Even in constructing his comprehensive and complex work on the application of mixed metholodologies, Pertti J. Pelto is a lively and engaging academic narrator, who succeeds to interpret deep issues and problems which have occupied generations of anthropologists. He weaves into the discussion his intensive long-term personal knowledge and experiences in multiple disciplines in various cultural settings, from the Skolt Sami in northernmost Europe to rural communities in South Asia. Pelto provides researchers and other actors, such as non-governmental organizations, with insights, strategies, and tools to apply mixed methodologies to health and social issues or economic and ecological understanding in an easily accessible manner." Many Problems in the Current Mixed Methods "Paradigm Concepts"
How Did Qualitative Data-Gathering Gain Acceptance in Quantitative-Dominated Research Areas? Quantitative Scale from "Full-Scale Farming to Full-Scale Herding"
Yankee City Series: Volume IV. "The Strike: A Social Analysis"
Extensive Participation: Sometimes It Is A "Supplemental Method"
More Specialized Survey Research "Experiments"
Major Finding: "Small is Not Healthy and Happy"
Triangulation in Qualitative Ethnographic Research: A Case of "Investigator Triangulation"
The Technical Assistance Program: "Building Social Science Capacity for Research on Women’s Health in India"
Pertti J. (Bert) Pelto, Ph.D., is Professor Emeritus of Anthropology at the University of Connecticut, where he played a major role in developing the program in applied medical anthropology. He has also served as a consultant for many international health organizations, providing training in mixed methods ethnographic research for community-based applied projects. Best known for his groundbreaking book on research methods (Anthropological Research: The Structure of Inquiry,1970), Professor Pelto was recently (2016) honored by the Society for Applied Anthropology with the establishment of the biennial "Pertti Pelto International Travel Award," in recognition of his contributions to training in applied field research methods in international contexts.